I have been puttering away on Jay's California album and I have finished another 6x12 page. This was an enlargement that I had printed at Costco in an 8x12 size. I narrowed it to 6x12 and then cut it up into 4x6 sections to add to the pockets. .....as well as the anchor and chain. I love how quickly a page can come together by simply matting my photos and adding a bit of die-cut cardstock. Pocket pages are my favouite way to scrapbook, especially with so many photos to get into this album. Do What You Love - Silhouette Cameo Deco!!! I am finally getting around to sharing my decorated Silhouette Cameo!!! I just love it. I was teaching a Silhouette workshop using vinyl and I decided that decorating our Cameo was a good way for everyone to get some hands on experience. This is what I came up with!!! I picked a quote from the Silhouette online store. I tried to select something inspiring and motivating. In the workshop I wanted to demonstrate how to layer different colours so I chose to add these adorable butterflies to my design. My final detail was to add a heart next to the Cameo logo.....because I really LOVE my Silhouette. It looks great sitting in my craft room and brings a smile to my face everytime I see it. Thanks for visiting!!! What a great weekend!! We are finally getting some decent weather. Monty and I spent some time out in the backyard working on the gardens. We didn't really have time for much last summer, as we were just moving in. There were quite a few plants that we didn't like, so we pulled them out and cleaned everything up a bit. I did manage to snap a few pictures while we were working. On Sunday we spent some time with both my mom and hubby's family too. I made sure to get some photos with my kids. I am such a proud mom!! This is my favourite one. Look at those smiles. Love these guys. We also made sure to get a photo of these two. Kevin and Amanda make such a cute couple. It was a great weekend all around. I took a little break from my regular scrapbooking to make a couple of cards for Mother's Day. I saw this new set of cut files from SVG Cuts and I just had to try them out. My favourite is the basket of strawberries and I thoug it would be perfect for a Mother's Day card. I used my Silhouette and sketch pens to create the sentiment, then I added a button and some twine. I embossed the strawberries with my Cuttlebug and then sanded the dots to expose the core colour of the paper. I used some enamel dots for the centers of my flowers and added a ribbon too. There are a few other versions of these cards and I think I will be trying them out too. I have been trying to do some of the NSD challenges over at Two Scrapbook Friends, and I managed to complete another one last night. This time I played along with Amanda's challenge to use splatter. I created another pocket page (just a small one this time, cause I only had a couple photos to work with) and I used splatter on the background. To make the camera, I used a template and traced the pieces out and then hand cut them. I used some foam adhesive to pop some of the pieces up, which created some awesome dimension. The 'remember this' was cut out on my Silhouette. Thanks to Amanda for a great challenge. I am off to link it up over on the Gallery!! I have been hard at work on Jay's album again. I just love putting layouts together for this trip. I have been focusing on some of the pocket page layouts and I thought I would switch it up and work on a single page. Here is my latest creation. It is for one of the Two Scrapbook Friends NSD challenges. I did this layout for Jayne's 'Cut it Out' challenge. I had a lot of fun playing with my Silhouette (using the latest update) and made up these film reels, photo strips and viewfinder icons. These photos were taken just after we exited the Revenge of the Mummy ride (which I hated). This creepy guy kept following us around. I added in some stickers that I had from an old Simple Stories collection (Awesome). I mixed some alpha stickers with some chipboard Thickers for my title. Two Scrapbook Friends National Scrapbook Day Blog Hop!! 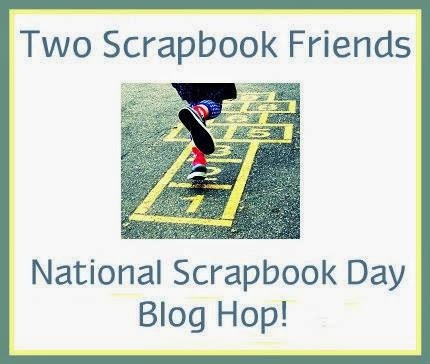 Welcome to the Two Scrapbook Friends National Scrapbook Day Blog Hop! You should have arrived here from Joanne's blog. I just love how she uses texture. I actually watched her create some of this layout and she is truly talented. I am sure she has inspired you to create some texture on your projects! My letter is P - for pocket pages. I love this new way of scrapbooking. Do you know what 'pocket pages' are? They are divided page sleeves for your album. They come in all different configurations and they really help streamline the creative process. For my design, I used 2 different sleeves - one with 4x6 vertical pockets and one with 4x6 horizontal/3x4 vertical pockets. It is fun to mix up the sleeves and create a different layout each time. I used one of the Simple Stories Sn@p collections - Everyday!! It is bright, colourful and very generic. It was perfect for some photos I had of Jason and David at Universal Studios visiting The Simpsons Ride. I find it easier to work with the small sections of my layout and you don't have to add much to make a big impact. A technique I use a lot is to cut a photo and divide it up across 2 different pockets. I still like to mat my photos and add some ink, just like I do for my traditional layouts. Journaling on my layouts has become a regular part of my pages now. I often leave it off when doing traditional layouts, or add it as an afterthought. The pockets make it very easy to designate a special spot to record the memories. I love how many photos I can include for each design. It is a great way to use up the photos that I have in boxes and get them into my albums. If you haven't given pocket pages a try, I hope you will now. Our store is filled with products to help you get started or add to your collection. Now you should hop over to Christa's blog. Remember to leave a comment on each blog as you go. This way you will qualify to be in a draw for a fabulous Blog Hop prize.